Leisurely ride around Richmond ending with a stop for lunch at the group’s choice of: Flying Beaver, Doshas or Shanghainese. Terrain is flat and pace will be moderate (~18kmh). All are welcome and no one will be dropped. 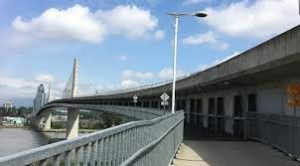 Meet: 10am at SOUTH end (Richmond side) of Skytrain bridge (this is on River Drive at Van Horne Way). Note this is not the usual meeting spot for recent leisure rides. RSVP: Email to Will if you are coming and we will make sure you are there before we depart. Route: simple circumnavigation of Richmond, about 30km; something like this. This entry was posted on Saturday, September 30th, 2017 at 10:41 pm and is filed under Old Rides. You can follow any responses to this entry through the RSS 2.0 feed. You can leave a response, or trackback from your own site. Many thanks to Will for leading this ride. He had to give up an important Pokemon tournament to attend. The weather gods were merciful, with no rain, just cool temperatures. Eight of us wound around Richmond clockwise and entered Steveston via the South Dyke trail with nice views of the Fraser River and Finn Slough. Topped it off with hearty dosas, everyone’s favourite food baton. Nice to see some new and familiar faces. A big welcome shoutout goes to newbie Anwar!